Steam is a digital distribution, digital rights management, multiplayer and communications platform developed by Valve Corporation. It is used to distribute games and related media online, from small independent developers to larger software houses. Steam is best known as the platform needed to play Source Engine games (e.g. Half-Life 2, Counter-Strike). Today it offers many games from many other developers. Installing the steam-native-runtime package takes care of some of problems identified below. Start steam with steam-native. If you have a 64-bit system, enable the multilib repository. Steam may fail to start due to broken/missing libraries. See Steam/Troubleshooting#Steam runtime issues. Steam makes heavy usage of the Arial font. A decent Arial font to use is ttf-liberation or the fonts provided by Steam. Asian languages require wqy-zenhei to display properly. If you have a 64-bit system, you must install the 32-bit Multilib version of your graphics driver, and lib32-curl, lib32-libgpg-error to enable update at first run. Several games have dependencies which may be missing from your system. If a game fails to launch (often without error messages) then make sure all of the libraries listed in Steam/Game-specific troubleshooting are installed. In case that you are using Arch Linux in your local language, make sure that you also have properly generated en_US locales (see Locale#Generating locales). Otherwise Steam client wont start with invalid pointer error. Note: Using skins that are not up-to-date with the version of the Steam client may cause visual errors. 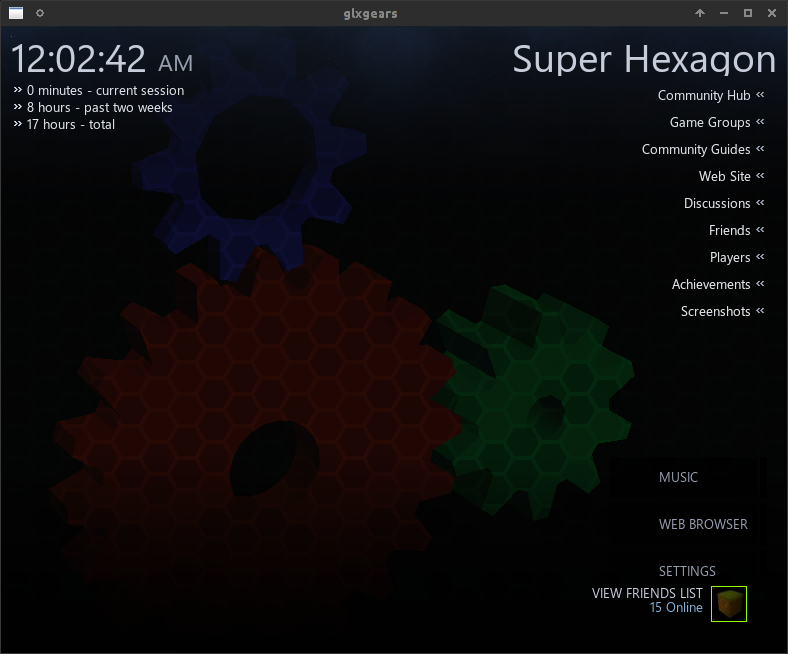 The Steam interface can be fully customized by copying its various interface files in its skins directory and modifying them. An extensive list of skins can be found on Steam's forums. Note: A handful of games do not support this, for example this can not work with XCOM: Enemy Unknown. Then modify the correct files. Top-Right/resource/styles/gameoverlay.style will change the corner for the in-game overlay whereas steam.style will change it for your desktop. This line will look the same in both files. Repeat the process for all the 3 variants (Top-Right, Top-Left and Bottom-Left) and adjust the corners for the desktop and in-game overlay to your satisfaction for each skin, then save the files. To finish you will have to select the skin in Steam: Settings > Interface and <default skin> in the drop-down menu. This method is more compatible with future updates of Steams since the files in the skins above are updated as part of steam and as such if the original files change, the skin will not follow the graphics update to steam and will have to be re-created every time something like that happens. Doing things this way will also give you the ability to use per-game notification locations as you can run a patch changing the location of the notifications by specifying it in the launch options for games. Steam updates the files we need to edit everytime it updates (which is everytime it is launched) so the most effective way to do this is patching the file after Steam has already been launched. mostly_black "0 0 0 240"
semi_black "0 0 0 128"
semi_gray "32 32 32 220"
Note: The patch file should have all above lines, including the newline at the end. You can edit the entry and change it between "BottomRight"(default), "TopRight" "TopLeft" and "BottomLeft": the following will assume you used "TopRight" as in the original file. And most games you launch after this will have their notification in the upper right corner. You can also duplicate the patch and make more aliases for the other corners if you do not want all games to use the same corner so you can switch back. And the launch options should be something like the following. There is another file in the same folder as gameoverlay.style folder called steam.style which has an entry with the exact same function as the file we patched and will change the notification corner for the desktop only (not in-game), but for editing this file to actually work it has to be set before steam is launched and the folder set to read-only so steam cannot re-write the file. Therefore the only two ways to modify that file is to make the directory read only so steam cannot change it when it is launched (can break updates) or making a skin like in method 1. Tip: This option can be added to a desktop entry.